Mubarak Verdict Due On June 2 : The Two-Way If he's found guilty of ordering the deaths of protesters last year, Egypt's former president could be put to death. 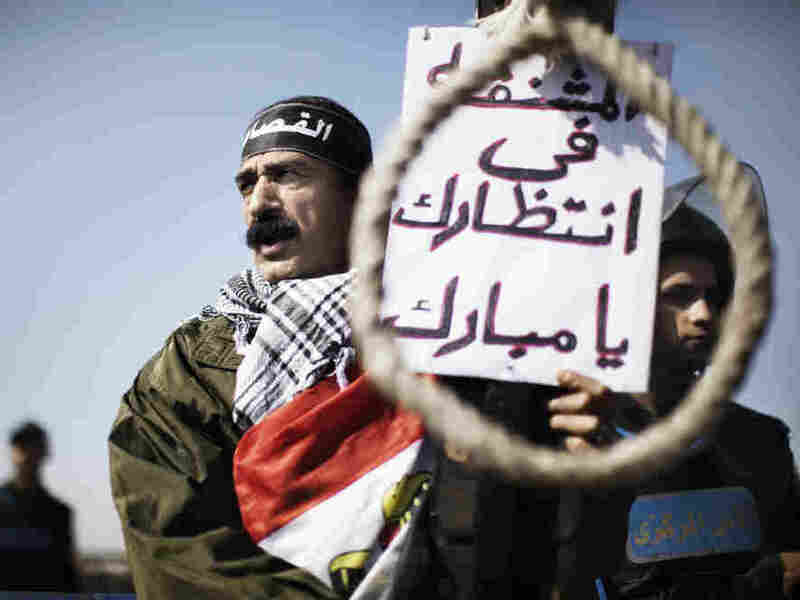 Outside the court in Cairo where former Egyptian President Hosni Mubarak has been on trial, a man earlier today held a sign saying there was a noose waiting for Mubarak. As the case against former Egyptian President Hosni Mubarak came to a close today, the trial judge announced he expects to deliver a verdict on June 2. "Mubarak turned down a chance to address the court , the prosecution has called for the death penalty. If convicted, Mubarak, his interior minister Habib al-Adly and six security chiefs could receive the death penalty for ordering the deaths of protesters during the uprising that toppled Mubarak a year ago." NPR's Soraya Sarhaddi Nelson explained on Morning Edition that if he's found guilty, Mubarak is expected to appeal the decision. And if he's found not guilty, "the fear is that people will be outraged" and there could be more violence in the streets of Egypt's cities.